Ongoing assessment of Technical Officials (TOs) in Triathlon is critical in ensuring all TOs meet the required level of competence required by the International Triathlon Union (ITU). Feedback resulting from ongoing assessment, enables the ITU together with each TO to create a specific development pathway for the TO helping them improve their skills and knowledge and apply them in different triathlon situations. The ITU TOs assessment and feedback program forms part of ITU Technical Education program, which aims to give feedback to TOs on their performance prior to, during and post events. This enables the ITU to create an evidence-based database of all its TOs which serves in the evaluation of ITU’s education programs and informs the appointment of the most competent ITU TOs to events. 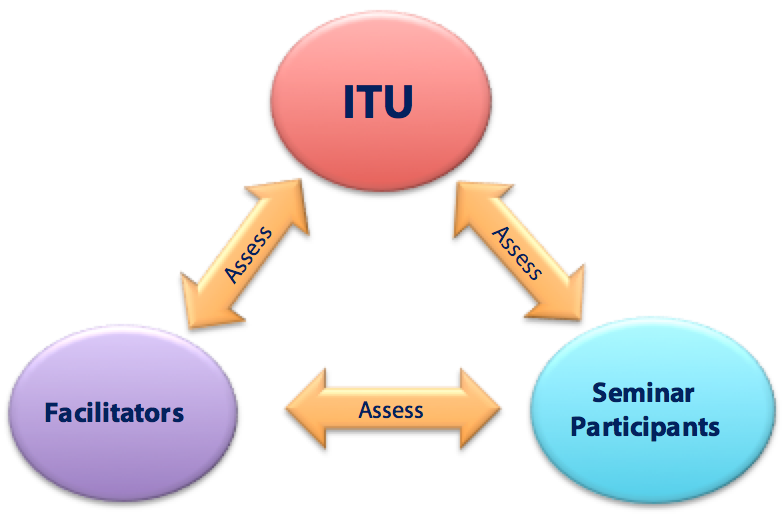 The ITU assessment and feedback program is used in respect of ITU TOs Seminars and ITU Events. Assessment and feedback at ITU TOs Seminars is a three-way process involving the TOs attending the seminar, the Facilitators leading the seminar, and the ITU Sports Department. The TOs participating in the seminar are expected to evaluate and provide feedback on the facilitator’s presentation and performance including the content and usefulness of the seminar itself. This is being done by completing an evaluation form at the end of the seminar. The ITU Sport Department collects all of these evaluation forms and assesses the facilitator’s performance along with the facilitator’s seminar syllabus/plan (learning outcomes, content, schedule etc.). As a result of this process, an action plan is created for improving both the facilitator’s delivery and the seminar’s syllabus. The seminar facilitator(s) assess the individual performance of each TO throughout the seminar. This includes their level of understanding, interest, participation, application of theory to practice, etc. This assessment is taken into consideration when certifying successful participants along with other elements of assessment such as written exams. The ITU Sports Department may deploy experienced facilitators to assess the performance of the seminar facilitator(s) to confirm them as Lead Facilitators. Part of this process will include the formation of a personal action plan for each facilitator which is part of our commitment to ongoing personal development and continuous improvement. Experienced facilitators will also be deployed to quality assure TOs seminars as part of our commitment to upholding high standards and to continuous improvement of our sports education program. The LOC uses a standard assessment form to evaluate their TD which is submitted to the ITU Sport Department post event. Similar to the assessment that is being conducted by the LOC, when a Team Leader is appointed at an event (ITU events only), he/she needs to conduct an assessment for their TD, following the same assessment protocol mentioned above. The Technical Delegate for each event is responsible for performing this assessment. Similar to the aTD’s assessment process, the ITU through the assigned TD, conducts an assessment of the International Technical Officials who are selected and appointed to the highest level of ITU events. 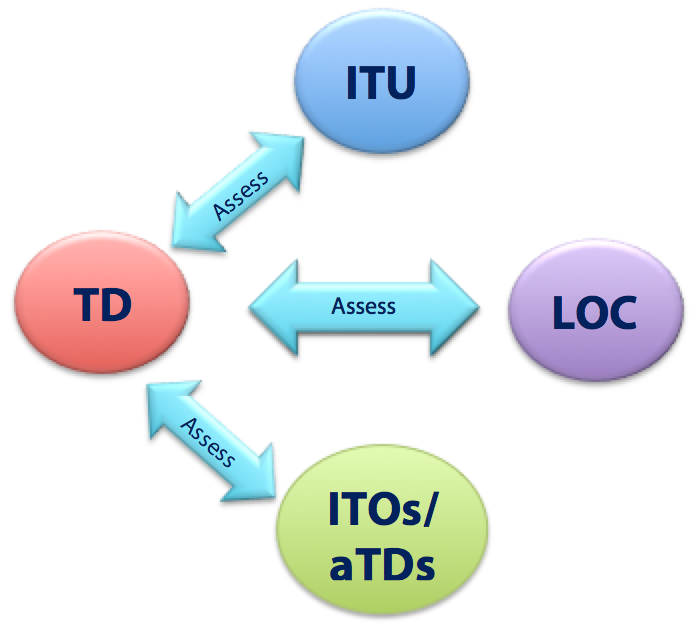 The qualities of the ITO that are assessed are the same as those for the aTD’s assessment protocol. The Technical Delegate for each event is required to submit to ITU a post-race report as a way of transferring the knowledge gained during the event. A component of this report is an evaluation of the team of TOs. Each TO is individually assessed based on their performance at their respective positions. This evaluation is numerical from 1-5 and it does not include the analytical form that is being used for TDs, aTDs or ITOs. Through a number of pre-event and post-event conference calls between the TD and ITU Sport Department, the ITU TD is given the opportunity to provide constructive feedback on the management of the ITU event. This feedback is valued and is taken into consideration during the annual events planning process. Following assessment of all TOs and submission of the assessments to the ITU Sport Department, there is a filtering process in place for this information and this is the stage where it is decided whether further follow up is needed with the technical official in question, or not. In the case that more clarification is needed about a TO’s performance, a meeting is scheduled in order to discuss and decide on an action plan or development pathway for the technical official in order to strengthen the official’s competencies. The assessment process is followed for all ITU Events. The process involves both assessment and feedback not just on an individual TO’s performance on the field of play, but also and especially for Technical Delegates on the preparation before and after the event. The assessment and feedback process is not set up to negatively criticize, intimidate or scare TOs, but rather to assist in their personal development as a TO and to assist the ITU maintain and improve standards of officiating at its events. Some people fear assessment and feedback because of previous negative experiences, fear of failure, lack of confidence, high expectations or over estimation of the level of performance required. This can affect the performance of a TO and may result in a distorted picture of the TO’s real ability. (vi). We ensure the Technical Official is informed they will be assessed and against what criteria. The assessment and feedback process endeavors to empower TOs to develop a cooperative relationship. Although, ultimately, the assessor must make a decision on performance, both parties are involved in as much of the process as possible. The result is that the TO can take a more realistic view of their own level of competence as they have received feedback. Self-assessment is also a great method for the TO to explain their level of knowledge or performance. This is gauged by asking the TO how they think they performed at the event(s). The emphasis is on communication and participation.